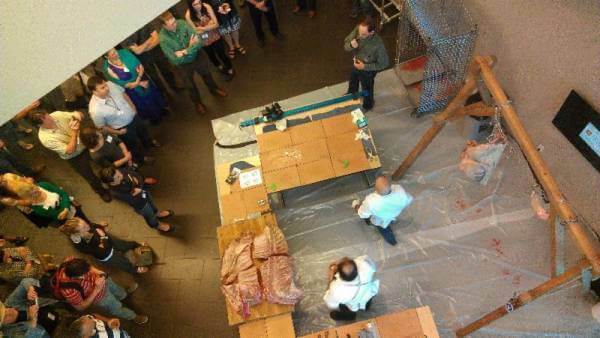 Bill Rogers, owner of Colorado’s Sweetwater Bison, shown above at upper right, donated a grassfed bison for a fabrication demonstration presented by the Rocky Mountain Institute of Meat during the first-ever Slow Meat conference in Denver. Rogers is among roughly 40 ranchers who get their meat custom-processed at Ranch Foods Direct. One hundred delegates attended the event on behalf of the Slow Food organization, including Ranch Foods Direct owner Mike Callicrate. Organizers plan to hold the conference again in 2015 and open it up to the public, according to Matt Jones, the founder of Slow Food Denver and current board chairperson of Slow Food USA.